This year the world’s largest energy consumer made a deliberate decision; and that choice will make all the difference to energy for decades. China has chosen to invest heavily in the leadership of manufactured energy technology, rather than accept a long-term dependence on the classic fossil-fuel energy system. The impact will be quick: in 2018 China will start to exploit lower-cost power generation, push innovations in scalable energy technologies and assert global EV leadership. Global energy demand is growing, but only weakly at about 1% per year, as primary heavy industries cede to service-based economies, and energy efficiency improves. Conversely, new energy technologies of wind, solar are growing rapidly at 15-20% pa, eating in to this weak demand, as they drop in price rapidly due to manufacturing learning curves. Never, until now, have the world’s energy consumers been able to access such a distinct form of non fossil-fuel energy at scale, and at reasonable cost. 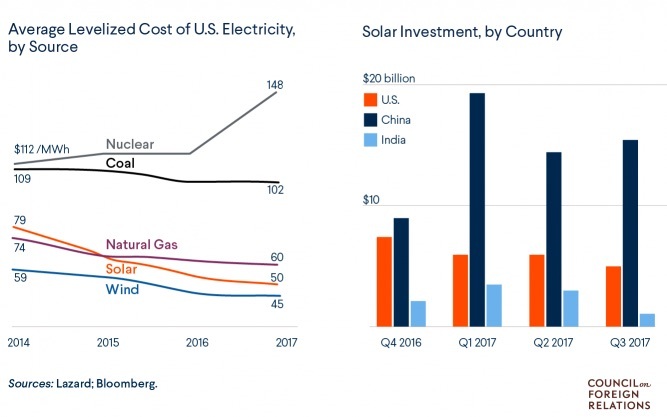 The chart below shows how in the US (and increasingly globally), solar and wind power are now lower cost on a levelised basis than traditional thermal fuels, and complex options such as nuclear or hydro. This is because manufactured technologies enjoy a positive feed-back loop: the more they are deployed, the lower the unit manufacturing costs from learning and scale, so the more they are deployed. Individuals, companies and countries now have a choice – they can ignore the new energy alternatives, embrace them or hedge their bets. In 2017 it is clear from the chart that the world’s largest energy consumer, China, stood at this fork in the road of their energy future and took an informed, strategic and conscious decision: to be the global leader in the world’s new energy technologies. China has endured the classic thermal fuel system rather than benefitted from it. Its most abundant indigenous fuel supply is coal, which is hard to make economically efficient (see chart above), and which has resulted in major health issues for its rapidly expanding urban populations. China also only has modest local supplies of oil and gas – for example it currently imports over 60% of its oil demand. Chinese oil companies such as PetroChina have therefore ventured world-wide for fuel reserves and expertise – but this is an expensive and complex business, and does little to reduce the underlying dependence. Where China does have global advantage however, is in manufacturing expertise and an ability to align government policy behind it. So, as the new global energy technologies of wind, solar and batteries have developed to commercial scale, China has been able to turn its inherent strengths toward energy manufacture rather than energy extraction and importation. 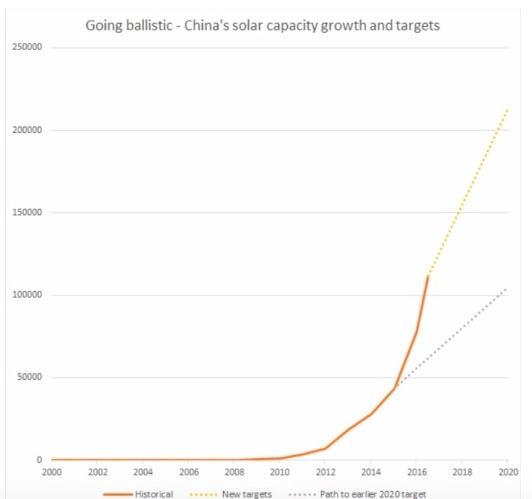 Consider this: recent Chinese targets for solar deployment in 2020 (110-150GW) were met in early 2017, so new, more expansive targets were set this year to 213GW by 2020 and a new, more confident trajectory created. To put this in context, total global installed capacity of solar will be 380-400GW by end 2017: so China now manages over 33% of the world total, and over 50% of the capacity installed this year. 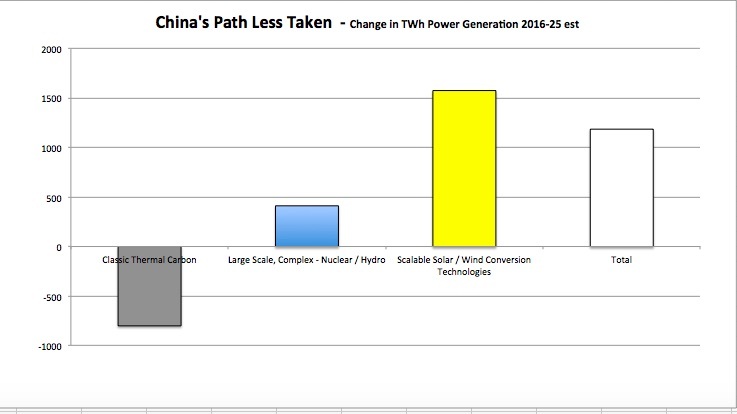 Extrapolating current growth to 2025 shows how much the generating power of China will shift in just 8-9 years: thermal fuels enter chronic decline, complex nuclear and hydro plateau whilst manufactured wind / solar increase at a rate of 15-20% growth per year. Note: dollarsperbbl calculations based on current growth rates / targets, with annual power demand growing at 1.5-2% pa.
A shift on this scale of capacity and generation will spawn massive new knowledge in manufacture technique, deployment efficiency, grid integration, software management, battery storage and so on. It also forces innovation in policy transitions to manage the upheaval in incumbent energy sectors: hence the introduction of a Chinese national carbon trade system this month. So the impact of this transition will be felt well beyond China’s borders: some of these engineering or policy advances will not be exportable for technical or cultural reasons – but many of them will. Once assumed to be the next oil consumption giant due to high growth in its transport market, the Chinese auto industry is now choosing a different track too. The Chinese government have mandated quotas of 10% EVs for major manufacturers in 2019, and 12% in 2020 which will push annual Chinese EV sales to over 2million by 2020, or an estimated 50% of the world total. 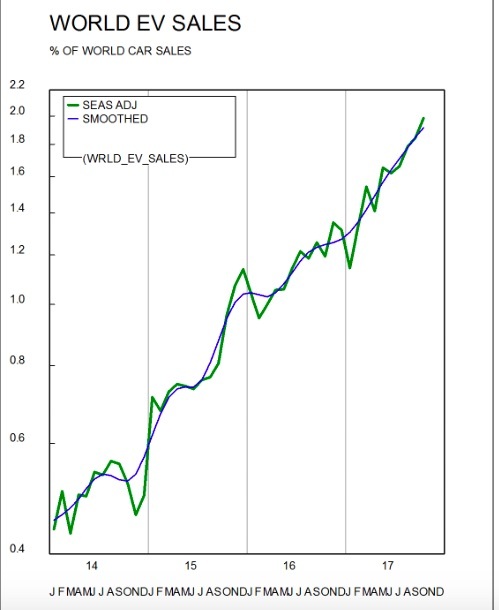 In 2017, EV’s constituted over 2% of global EV sales: this is only 18 months after they breached the psychologically and economically important 1% sales barrier in Q1 2016. For followers of Moore’s Law of technology improvement, this doubling of capacity in 18months should ring a few bells. source: volewica – Note the chart uses a log scale, – so the straight line indicates the growth is accelerating, even though there are limited EV models available as yet. And for followers of Wright’s Law of manufacturing improvements, the likelihood of China beginning to dominate the global EV sector is increasing rapidly, as learning experience allows their local automotive industry to swiftly improve costs, and export expertise. As if to underline this point, in December 2017 the Chinese (strongly-funded) start-up NIO released the NIO ES8: this may be a complete unknown car model as yet, but it’s a home-grown Chinese electric SUV that has a one-charge range of over 500km, and is cheaper than the Tesla X and a gasoline-powered BMW X5. If China had been endowed by vast oil and gas reserves, it may have been already consumed by its vast population, or exploited for vast margin. An incumbent, powerful fossil fuel energy lobby would have also encouraged policies to support fossil fuel dominance. Or, if OPEC had decided to flood the market with low prices for the long-term, China may have been able to live much longer with an import dependence. But neither of those events happened: as a result China recognises is does not have enough indigenous fossil fuels to survive on, and OPEC’s pricing actions have reinforced the vulnerabilities of accepting import dependence. So the energy world ahead of us is one where its biggest consumer has now chosen to embrace the manufacture of energy to survive and reliably prosper. With China’s expertise, and the universal nature of manufactured technology, energy in the form of solar PVs, wind turbines, efficient large batteries and electric transport vehicles will soon be available, at reasonable cost, across the globe. These technologies will come from leading Chinese companies, and from international firms and JVs responding quickly to the Chinese actions. The world of mass energy has never encountered a global learning curve of manufacturing: it has only ever known the flat economics of extraction, as the Lazard chart showed. Much as US shale oil has shown how modular manufacturing can up-end the oil sector, Chinese global energy manufacturing will now quickly transform the global energy market. Much happened to distract us in 2017. But mark this conclusive shift in world energy: China has now chosen to invest heavily in the leadership of manufactured energy technology, rather than accept a long-term dependence on the classic fossil-fuel energy system. (1) – There seems to be much debate about whether Frost used the poem to show the power of decision-making, or highlight problems of indecisiveness – we’ll take the former view; his phrasing is wonderful in either case.